Accompanied by his guide and faithful friend, Prabaker, the two enter Bombay's hidden society of beggars and gangster, prostitutes and holy men, soldiers and actors, and Indians and exiles from other countries who seek in this remarkable place what they cannot find elsewhere. 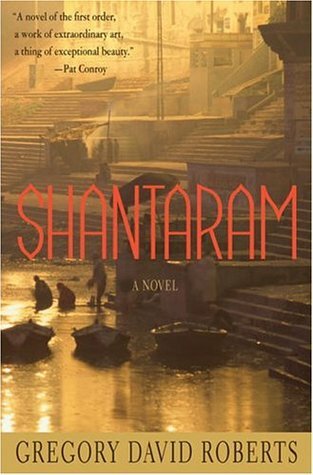 Shantaram really deserves some sort of spotlight, because I feel like it has a lot to offer. It's a massive read, but the writing is beautiful and easy to read. I just wanted to add in some things I missed in the video, because this novel seriously had so much going on. I loved the vibrant setting and how realistic it was. But more than that, I loved the connection the characters had towards the country. There is a lot of praising of India, which can be overwhelming sometimes because it felt like Roberts was giving all the positives but disregarding all the negatives that also come with the country. However, I could really believe that he loved the country as much as he portrayed it. The characters themselves were amazing. They all had their own voices and stories that were memorable. I pretty much loved all of them even if they weren't all "good characters" and managed to develop some attachments. It's definitely a hate it or love it read but see what else I thought about it! P.S Shantaram is actually the only novel published in the planned quartet despite it supposedly being the second book. Roberts has the sequel coming out very soon, before the prequel to this is released. I know it's confusing. I touched upon the things that I enjoyed and had issues with in the video but I do feel like I want to offer something more. Like I said, I didn't enjoy the glorifying of the mob/gangsters. Lin dives into this world and even though you get to see the violent, bloody battles, there's still a lot of emphasis about wealth and comfortable living. The gangsters are revered in the story and whilst everyone knew they were working around the law, the community - including authority - turned a blind eye because the profit and advantages outweighed the damages. It's a very conflicting portrayal, especially with the constant mention of doing "wrong for the right reasons". It raises questions about whether it is justifiable to kill, steal or other criminal acts if the act was for the "right" reasons. Does that essentially mean some acts can be above the law and deemed acceptable? I found that very interesting but not entirely something I support. It does show though, that the world is very gray. There is no black or white, right or wrong, good or bad. That's where Shantaram excels - in pushing ideas and concepts that make you question yourself and really think.